Today I want to write about a snake that has very beautiful markings and a very dangerous bite, the banded sea krait. Male banded sea kraits grow to about 90 cm log, whilst females are much larger, growing up to 140 cm long. They often hunt in small groups and eat eels and small fish. The females are able to swim deeper than the males to hunt because they are larger and can cope with the pressure. They are able to dive for up to two hours as they can absorb some oxygen through their skin. 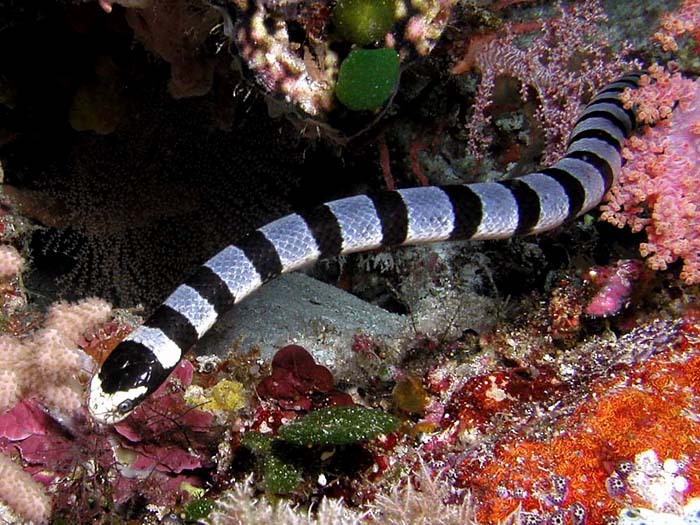 Banded sea kraits are very unusual as they are able to survive in the sea and on land. Most snakes either do one or the other. They lay their eggs in the sand and often return to the same beach. They also only drink fresh water, so they have to come to land to drink. They are one of the most venomous snakes in the world and one bite can be fatal. However, they are not very aggressive and very rarely bite. Banded sea kraits are found in the coastal waters of New Guinea, many Pacific islands, Philippines, southeast Asia, Sri Lanka, China and Japan. Are there any other interesting facts that you would like to share about banded sea kraits?